Vanilla flavored marshmallow candy pieces with chocolate coating. 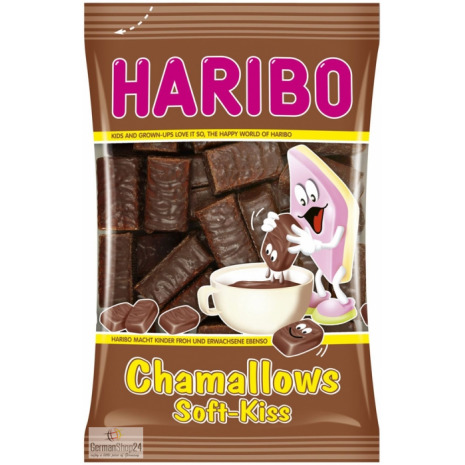 The Soft-Kiss of the Haribo Chamallows are chocolate coated marshmallow candy pieces. The special combination of the delicious vanilla flavor and soft melting chocolate coating offers a completely new, unique taste sensation. Made in Belgium. Cocoa-containing glaze (sugar, coconut fat, palm kernel fat in varying proportions (completely hydrogenated), low-fat cocoa powder, SKIMMED MILK POWDER, SWEET WHEY POWDER, LACTOSE, stabilizer: sorbitan tristearate, emulsifier: SOY LECITHIN, flavoring), glucose syrup, sugar, water, humectant: sorbitol, dextrose, gelatin, flavoring. 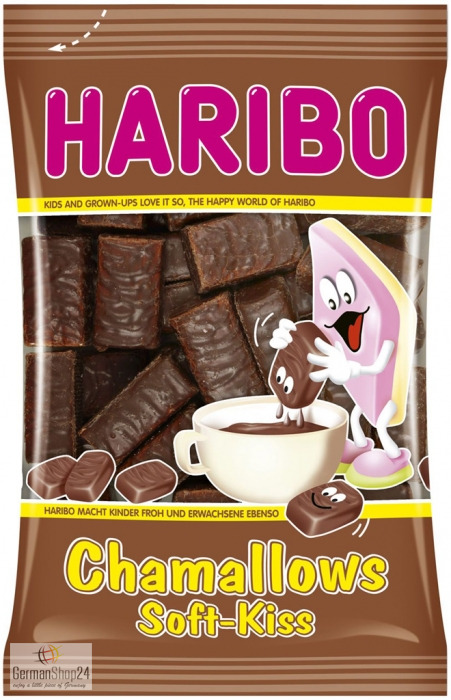 Kakaohaltige Fettglasur (Zucker, Kokosfett, Palmkernfett in veränderlichen Gewichtsanteilen ganz gehärtet, fettarmes Kakaopulver, MAGERMILCHPULVER, SÜSSMOLKENPULVER, MILCHZUCKER, Stabilisator: Sorbitantristearat, Emulgator: SOJALECITHINE, Aroma), Glukosesirup, Zucker, Wasser, Feuchthaltemittel: Sorbit, Dextrose, Gelatine, Aroma.